← Does Exercise Help With Weight Loss? I’m considering whether I should advise my patients with diabetes to pay careful attention to the protein content of their diet. It’s an important issue to Dr. Richard K. Bernstein, who definitely says it has to be taken into account. The liver (and the kidneys and intestines to a lesser extent) can convert protein to glucose, although it’s a slow and inefficient process. Since the conversion process—called gluconeogenesis—is slow and inefficient, diabetics don’t see the high blood sugar spikes they would see from many ingested carbohydrates. For example, 3 ounces (85 g) of hamburger patty could be converted to 6.5 g of glucose under the right circumstances. Protein foods from animals (e.g., meat, fish, chicken, eggs) are about 20% protein by weight. Dr. B recommends keeping protein portions in a particular meal consistent day-to-day (for example 6 ounces with each lunch). He recommends at least 1–1.2 g of protein per kilogram of ideal body weight for non-athletic adults. The minimum protein he recommends for a 155-lb non-athletic adult is 11.7–14 ounces daily. Growing children and athletes need more protein. Each uncooked ounce of the foods on his “protein foods” list (page 181) provides about 6 g of protein. On his eating plan, you choose the amount of protein in a meal that would satisfy you, which might be 3 ounces or 6–9 ounces. If you have gastroparesis, however, you should limit your evening meal protein to 2 ounces of eggs, cheese, fish, or ground meat, while eating more protein at the two earlier meals in the day. In many respects—and going against the grain of a number of the medical establishment’s accepted notions about diabetics and protein—protein will become the most important part of our diet if you are going to control blood sugars just as it was for our hunter-gatherer ancestors. I haven’t changed my thinking on this issue yet, but will let you know if and when I do. I don’t talk much about protein in Conquer Diabetes and Prediabetes in part because I wanted to keep the program simpler than Dr. Bernstein’s. As with most aspects of diabetes, your mileage may vary. The effect of dietary protein on blood sugars will depend on type 1 versus type 2 diabetes, and will vary from one person to another. So it may be impossible to set rigid guidelines. If interested, you can determine how much protein is in various foods at NutritionData. This entry was posted in Diabetes Complications, Diabetic Diet, Dietary Protein and tagged blood sugar, Conquer Diabetes and Prediabetes, diabetes, Diabetes Solution, gastroparesis, glucose, protein, protein effect on blood sugar, Richard Bernstein. Bookmark the permalink. This was the topic of conversation at my house just this morning. 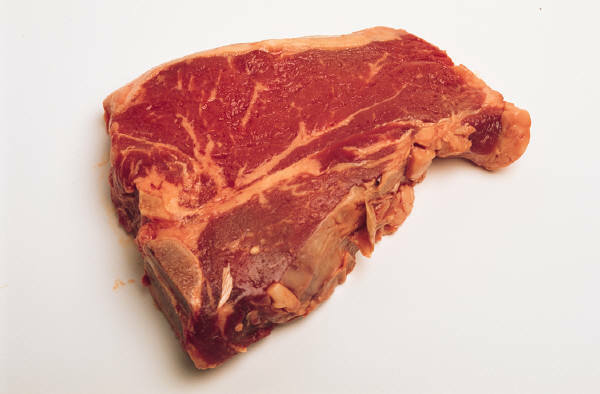 I ate a steak very similar to the one pictured last evening (barbecue) with some low-carb cauliflower salad, and my fasting blood sugar was up 15 points over my usual 90. I have noticed in the past if I eat a big steak meal in the evening, my blood sugar is always a lot higher the next morning and I feel fatigued to boot. I keep my blood sugars under control quite well with just diet except for eating excess protein occasionally. I hope I can learn not to overindulge in the future as it is not healthy for me. I’d be willing to bet that you have a lot of elderly T2D patients for whom sarcopenia is a big concern. Factor in the pretty well proven fact that the elderly don’t utilize ingested protein as well as youngsters, and it would seem best to err on the side of more protein, not less. If Suzie’s morning fasting glucose is CONSISTENTLY higher after an evening steak, then I’d be worried that without the steak, she isn’t getting enough protein to maintain her tissue mass (including heart muscle). Further, 105 isn’t diabetes. What would be serious is 240 an hour or two after a steak-only meal. I doubt that is happening, but I’ve erred before. My point: don’t skimp on protein unless you have a really good reason. When you’re 85 with a broken hip from a fall, you’ll regret it. Your moderate hypo (50 mg/dl) after an OGTT is indicative of reactive hypoglycemia… Do you test PPG? Have you considered metformin to help with your DP? I never suggested that Suzie_B limit her intake of protein. However, I did suggest that she read Dr. Bernstein’s “Diabetes Solution.” 🙂 » “If you are a long-standing diabetic and are frustrated with the care you’ve received over the years, you have probably been conditioned to think that protein is more of a poison than sugar and is the cause of kidney disease. I was conditioned the same way—many years ago, as I mentioned, I had laboratory evidence of advanced proteinuria, signifying potentially fatal kidney disease—but in this case, the conventional wisdom is just a myth. Nondiabetics who eat a lot of protein don’t get diabetic kidney disease. Diabetics with normal blood sugars don’t get diabetic kidney disease. High levels of dietary protein do not cause kidney disease in diabetics or anyone else.” —Bernstein, Richard K. (2011-11-01). “Dr. Bernstein’s Diabetes Solution: The Complete Guide to Achieving Normal Blood Sugars” (p. 131). Hachette Book Group. Kindle Edition.